Anna's hummingbirds, under 4 regimes of rain, seem to retain their composure, and more importantly, stability, a lot better than you would expect. 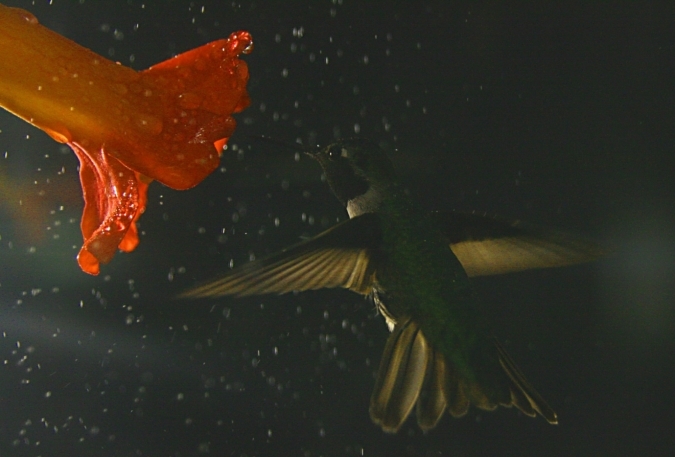 Rain is a pain in the tail if you are a hummingbird juggling with your flight controls. Wing mass and their moment of inertia are affected while the power needs to be turned on to maintain height. Apart from birds, bats and insects also maintain flight during heavy rain. Presuming this is important for survival and selection. Victor Manuel Ortega-Jimenez and Robert Dudley decided to design some intriguing experiments to test the mettle of this tiny aeronaut and publish their research today in the Proceedings of the Royal Society B: Biological Sciences. 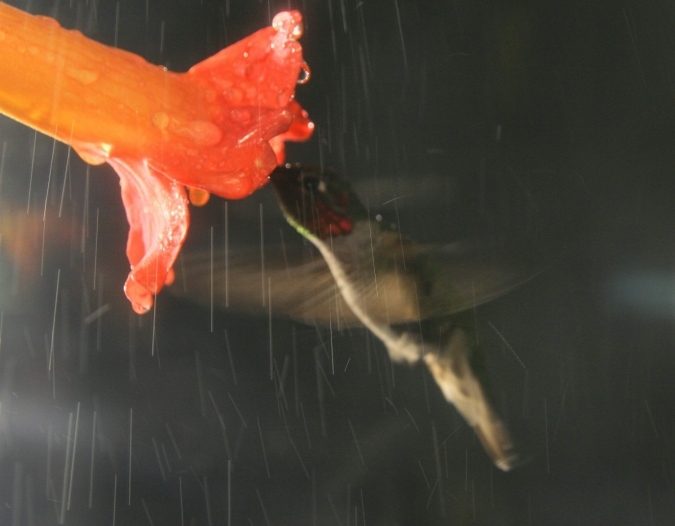 As Calypte anna is typical of the hummingbirds of the rainy eastern Andes, and also hovers in a manner similar to insects, its actions during heavy rain are important. All of its 325 (and abundant with it) relatives fly in heavy rain in the cloud forest and lowland rainforest. Such diversity must owe a lot to the ability to fly, feed and breed in these conditions. Under control conditions, there was no rain. In a Plexiglass cube, the animals had a perch and feeder. Nozzles carried tap water to simulate rain with a vertical downward path, while the rate was estimated every five minutes buy collecting the accumulated water. Body and tail positions changed according to the rain - horizontal positions were maintained during heavy downpours while the birds assumed more vertical positions when the "rain" was either light or moderate. A real difference was noticed when wing-beats increased during heavy rain. 9% to 57% increases in power output were measured. The need to feed is critical in a small bird that has to feed at least every 24 hours. If it can't feed in heavy rain, the food supply could be cut off for a longer period. Survival is the name of the game, and with reproduction also taking place in the mating season, nest building and chick rearing must require vast investment in such extreme capabilities (for flying in the worst imaginable conditions). Now for studies on the other birds that perform in these conditions and other smaller and larger animals that fly in them. There is a lot to discover and the rewards for biomechanics and ecology could be high. 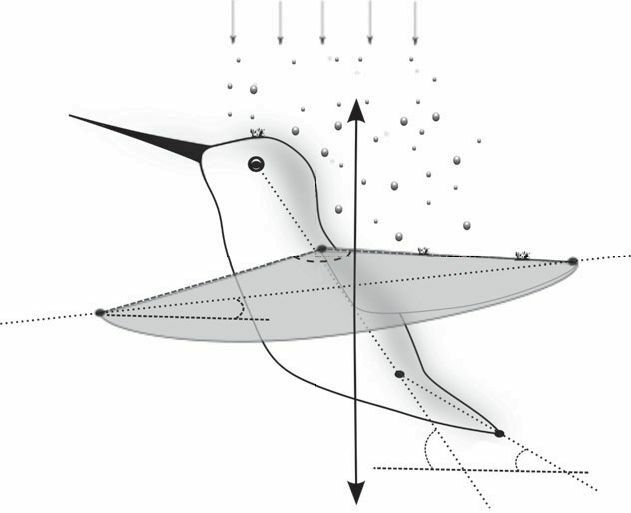 Here are the images of the valiant birds during heavy and light rain, with the typical more horizontal attitude plus the other features noted by the authors: "The low stroke amplitudes and higher wing-beat frequencies exhibited by birds during heavy rain may also act to reduce the wing disc area and the overall rate of drop impact on wings."